Signs Plus, LLC is your Sandblasted sign and 3D sign experts with convenient servicing locations in Nicholasville KY, Lexington KY, Richmond KY, and Somerset Kentucky. Sandblasted signs are a strikingly amazing way to promote your business location. Sandblasted signs take on an elegant handcrafted look to let your business stand out from your competition. 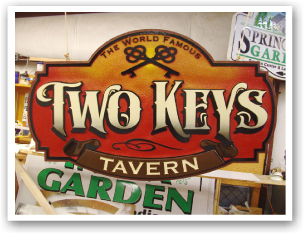 Sandblasted signs from Signs Plus, LLC offer craftsmanship and dimensionality second to none. A quality sandblasted sign or sandblasted wood sign produce results that immediately separate themselves from traditional flat signs. Our sandblasted wood signs feature carefully selected wood to help enhance the “old world” tradition of elegance and style. Wooden Signs are made from the clearest grade lumber available. Because the lumber is treated under extreme conditions in order to prevent warping and checking. Signs Plus, LLC only selects a small number of boards to move ahead to the manufacturing process. A rubber mask is placed over a sign blank that goes through the blasting process in order to create the dimensional effect in sandblasted signs. During the sandblasting process the areas of the sign that are to be sandblasted are removed from the rubber mask, which serves to protect the protruding raised areas from the sections to be sandblasted. Several coats of primer are then required to produce the proper seal. Layers are applied thin, dried, and then sanded smooth. This creates a strong barrier against any in-climate weather the sign is in. While not all wood signs need primed, natural finishes and stains dramatically add to the wood’s richness in detail. Finally, proper stains, enamels and clear coats are applied as needed. All of these steps provide Signs Plus, LLC customers with years of worry free signage use. 3D illuminated signs and light boxes are another way to separate your business signage from the competition. Signs Plus, LLC’s light boxes are framed and electrically wired to exceed industry standards and quality. Our design experts will work with you every step of the way to insure you get the exact 3D sign that you need. And, you can rest assured that your 3D sign will perform flawlessly for years to come because of our advanced engineering. Signs Plus, LLC’s 3D signs are an excellent way to make a favorable impression on your customers. 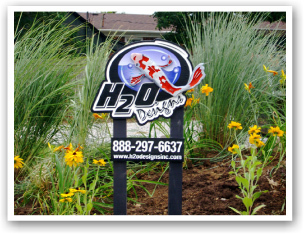 All 3D signs we manufacture have the goal of making your clients notice your business first. 3D signs come in a variety of materials, sizes, colors. Signs Plus, LLC’s 3D signs allow you to capture your business’ message and brand like no other signage available. A western attire clothing store can have a 3D wooden sign to capture the lure of the “old west.” A jewelry business can feature a 3D sign portraying sparkling diamonds. If you can imagine it, our designers at Signs Plus, LLC can produce it! We not only place your name on a 3D sign, but we try to show the essence of who you are and what you do. Together with Signs Plus, LLC, we can produce a 3D sign for your business that invokes imagination, creativity, and proven customer results. Contact Signs Plus, LLC today to discuss your sandblasted sign and 3D sign needs. We provide detailed information and all project quotes are free of charge.